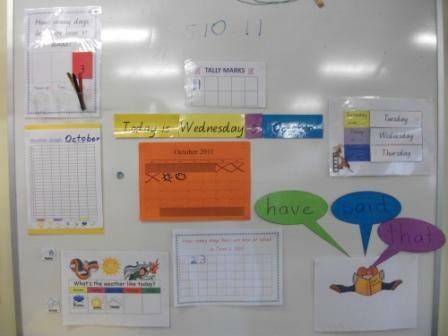 This term I have implemented a calendar time into our classroom routine. This time as an opportunity to incorporate lots of literacy and numeracy learning into our daily routine. We begin with the name of the day and the date, which the children write into their calendar journal. I use this part of the routine to practice their letter and numeral formation. For the first week the children wrote over dotted lines to give them a size guide. 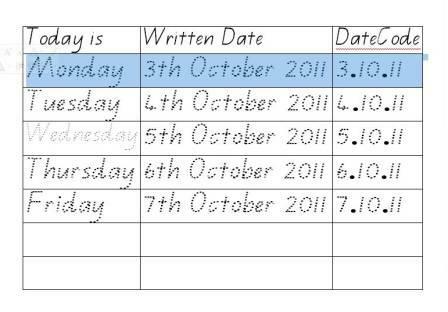 We have also learnt the “secret code” for writing the date eg. 3.10.11 is the third of October 2011. 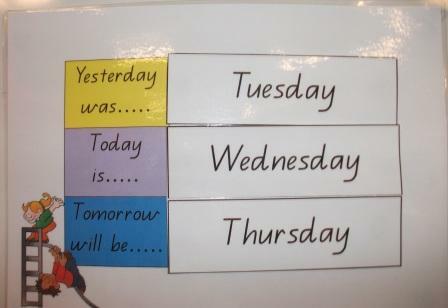 We enhance understandings of yesterday and tomorrow, which are time concepts young children often find difficult to grasp by moving the days up this chart. During the year we have used graphs to record data about lots of topics such as our pets and favourite vegetables. 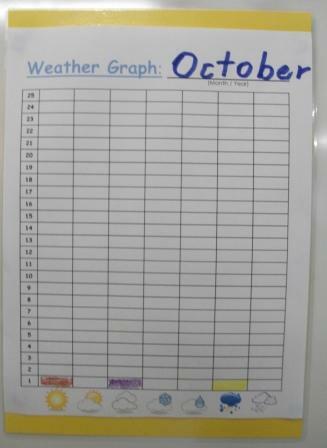 To further enhance our graphing knowledge and understandings, we are recording the weather on a monthly basis using a graph. This graph is in the children’s journal as well. 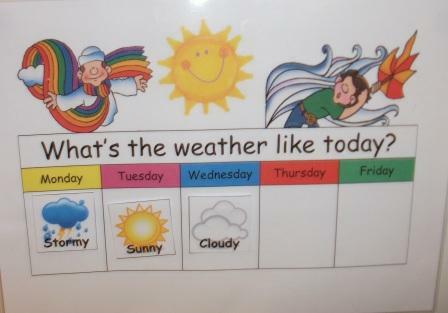 We also chart the weather on a weekly basis. The graphics for these charts were from a free web site called Pete’s Power Point Station. 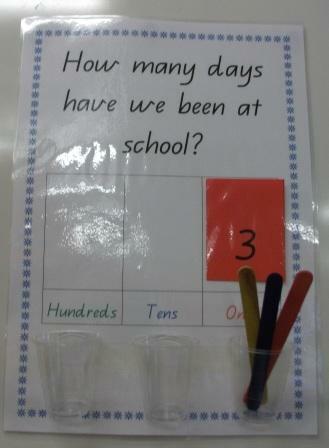 After the weather, we record the number of days we have been at school. This is a great opportunity to practice counting, numeral recognition and numeral formation. 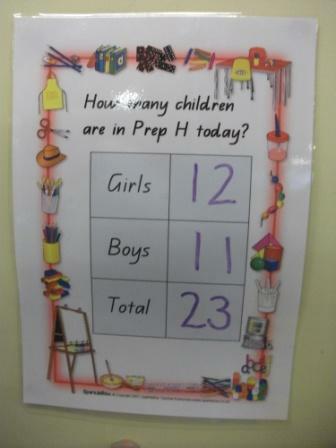 The children record this number in a variety of ways each day. On this page they write the numerals. On the next page, the children are exploring the concept of Tally Marks. We are also using concrete objects to explore groups of ten as we count the number of days at school. Every day we place a paddle pop stick in the ones cup. When we have ten we will bundle them up and move them into the tens cup. This activity is a real life way of learning about how we record and write numerals. 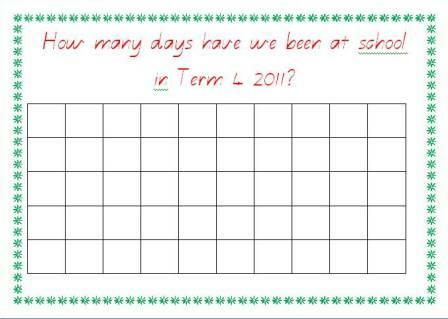 The final numeracy activity for Calendar Time is counting how many children are in class that day. All the girls/boys stand up and when counted (by tapping them on the shoulder) they sit down again. This number is recorded and the process is repeated for the other girls/boys. We also discuss how many children are absent. The children problem solve how many children are present in total based on all this information and then everyone stands up and is counted to determine the actual number present. The final literacy activity is to review our Sight Words for the week. 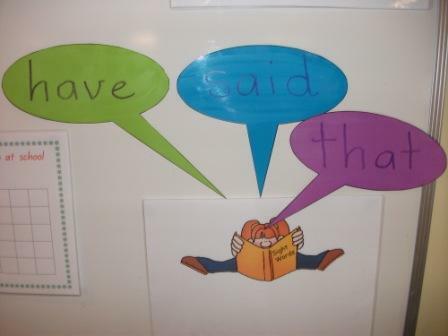 Each day I write them in the talking bubbles, with the children copying them into their journal on the Sight Word page. As I form each letter in the words, I use our Casey Caterpillar Handwriting language to assist the children with forming their letters correctly. This activity enhances both handwriting and sight word recognition. When we first began Calendar Time it would take us approximately 30 – 45 minutes, which, despite all the learning opportunities is a long time out of our day but, each day we have gotten a little quicker and can now complete the whole activity in approx. 15 minutes. The children really love filling out their journal and, during the first week, lots of parents asked about Calendar Time because the children were coming home everyday telling them about it. Calendar Time is quite a formal activity in our classroom and I am surprised at just how much the children enjoy this daily experience. Sometimes I wonder if it is because it is a real life experience or they like owning and completing a “real school type” book or if it is a sign of their readiness to move onto Year One. Perhaps it is a combination of all three? Whatever the reason, it has proven a valuable and engaging way of incorporating literacy and numeracy into our play based curriculum along with teaching the children the valuable “learning to learn” skill of how to organise themselves and find the correct work page in a book.